This week, I had a lot of fun working with the book Bear Snores On by Karma Wilson. I love the Bear series of books, they are just so sweet! 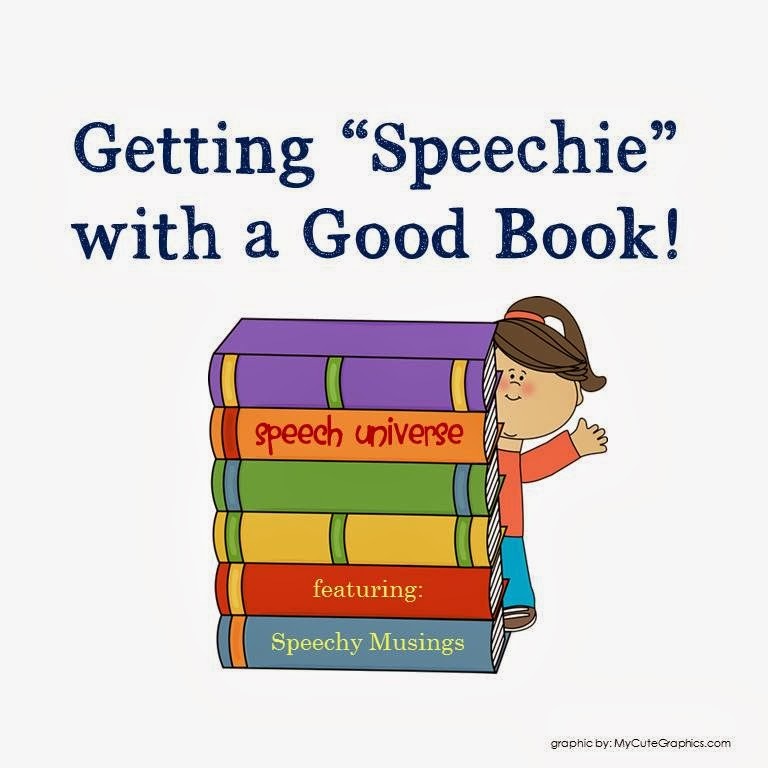 To work with this book, I used an awesome book companion by Shannon over at Speechy Musings. You can check out this companion HERE! This story really is very sweet. It is about a bear who is hibernating while his animal friends have a party in his cave without him. He eventually wakes up and realizes he has missed a lot of the fun. Spoiler alert! Don't worry, his friends console him, and he gets to join in too. These are open ended questions about the story. There are a wide variety of questions in this activity. These questions were great for working on some inference skills as well as more pragmatic skills. I thought this was really cute, but did not get a chance to use it. The group I wanted to use it with was cancelled one of the days this week because of a big IEP, so I only had one day with them. If I had an extra day, I would have totally done this activity! I made one of my own books, just as an example for the next time I use this packet. Basically, you write and illustrate your own version of the story. This is a matching game that matches a term to the definition. Shannon also provided some categorization titles to use for sorting the cards. Categories included: Sounds or Noises, Animals, Places, Verbs, Adjectives, and Nouns. These were great for some of my older students. I placed the cards on the table, and they had to unscramble the sentence from the story. For this last activity, there is a visual mat for placement, however I did not use it this week. I just placed the pictures on the table and had the students manipulate them that way. The sequencing cards are all provided in the Sentence Scramble activity. My students really enjoyed the book and the activities this week! Thanks so much to Shannon at Speechy Musings for providing my with a copy of this awesome packet to test out! I am taking a few weeks off from discussing specific book companions, but look next week to see how I organize all of my book companions. I know I will be printing and organizing over my two week break. The book companions will return in early January, and I have them booked through March! There are lots of great companions out there to share! This was the first "Bear" book that I bought, and I LOVE it! thank you for sharing!